Epson has delivered a surprisingly solid and affordable compact projector in the EX70. It offers several useful and unique new features and delivers good performance in a low-priced ($799) package built with the usual Epson quality and care. We typically spend our time with high-end home theater or large venue installation type projectors, so we were eager to take a look at what a more mainstream business class projector would look like. This is the kind of projector that could come in handy in a breakout room or similar situation at an event. The first surprise was the weight. As we took the unit out of the box, packed in its soft and well-designed carrying case, it almost seemed as if they forgot to send the projector. Opening the case proved it was indeed inside, and weighing in at just over six pounds, it is definitely a lightweight unit. For such a lightweight device, we expected it to feel “cheap.” Again, we were surprised. It certainly did not feel “cheap,” but was very well built and tightly assembled with good fit and finish. in this price category, and certainly welcome with the increasing use of HDMI in the market. We also found a card slot, and a USB port. The features list continued our recent “trend” of being pleasantly surprised by the EX70. The first thing we noticed was the resolution: 1280x800. Many people may think this an odd resolution, and it may be, thinking in terms of legacy projection. But consider this, the vast majority of laptops out there are now 16x10 and large numbers of those sport what resolution? That’s right, 1280x800. This means the image will not only appear more “natural,” but will work better with more laptops without any resolution changes or scaling issues. Very good and well thought out. The projector was specified at 2000 lumens, which is definitely enough for most presentations. The suite of inputs, complete with HDMI, was reasonably complete, though it lacks component video, opting for HDMI instead. Composite, S-video, and VGA inputs round out the connectivity, which to this reviewer is perfectly acceptable for an office machine. The USB and card reader ports puzzled us at first, and as we read more about their function, were quite surprised, yet again. The USB ports on the device are twofold in numbers and functions. One is a standard USB “B” connector. This I assumed was for a mouse pass through from the remote, as seen on other projectors. The second was a standard USB socket. Well, the functions provided by these ports are pretty impressive. The first USB port is not for computer control, or mouse function, but to actually connect the projector to a PC, and send video over USB. This is an impressive feature, to say the least. The software needed is automatically installed by the projector when you plug it in for the first time, after that, no configuration is needed, just plug it in, and you get video. Now, I’m sure you may be wondering why this is impressive — the EX70 has a VGA port, right? Yes, it does, but how many times have each of us experienced problems connecting VGA to a projector from a laptop? What about if it is in a conference room and many different laptops may be connected? The USB system means that all laptops will work with the EX70 equally well, and produce uniform images, leaving a lot of compatibility problems behind. Also, a lot of the newer super thin and ultra light laptops (MacBook Air, anyone?) lack a traditional video out, or have no video out at all. This solves that issue as well. 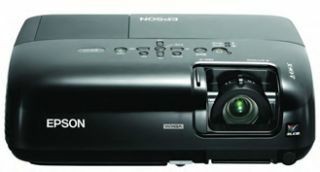 This is the first time we have seen this feature on a mainstream projector, and we definitely think Epson has really provided something impressive including it in the EX70. That leaves the second USB port with the standard USB socket. It turns out, on more careful reading, that this port works in conjunction with the card reader slot. In dealing with consumer flat panels, we have become more accustomed to seeing card reader ports for looking at photos directly installed into many devices, from the displays themselves to DVD players. We assumed the card reader slot on the EX70 worked similarly, and, in fact, it does, but when we read through the USB port function, it was obvious, that for office use, this feature actually is more useful than its consumer counterpart. When either a memory card (SD flash) or a USB thumb drive is inserted into the projector, it can display a presentation (in .jpeg) without any extra hardware, allowing the business user to avoid having to use a laptop entirely. We certainly appreciate that this can be a huge benefit. Changing presentations is much faster this way, and again helps deal with connectivity and compatibility problems outright. The projector also is very quiet when it is on, just pushing enough air to be heard, but certainly no hair dryer. It is also quite cool when on, making it far less obnoxious to have on a tabletop with people sitting near it while giving or viewing a presentation. It also has a built in “help” function button, right on the top, that provides some guided basic troubleshooting and assistance without any extra documentation. A welcome feature, to be sure. We would be remiss if we didn’t examine image quality, and the Epson was understandably a little less surprising here. Once powered on, it delivered a perfectly acceptable image, but certainly not home theater quality. The image was clear, with the optics doing a good job of delivering a flat, clean projection. It did provide above average dark area detail, which definitely was a surprise. For general presentation and office use, the image quality is just fine, and will work adequately for video, in a pinch. We tested it on a matte white screen, and the image was very uniform, with the colors looking fairly saturated when used in a good working environment. Definitely no surprises, but also, no disappointment either, especially when considering what Epson designed the EX70 for. The projector also includes the mandatory internal speakers. The volume was quite loud, although understandably a bit on the tinny side, but definitely listenable, and better than most other integrated projector speakers we have heard. This rounds out an overall package we were impressed with, and considering the price point, one you definitely need to consider, if you are in the market for a portable, presentation-oriented, projector. The EX70 is definitely a winner from Epson.